Stepping into the shiny, black marbled room accented with splashes of glossy scarlet that is the Vegas outpost of Joel Robuchon's L'Atelier, so 80's is the colour scheme you almost expect Robert Palmer and his bevy of thick-lipsticked harsh-looking guitar-strumming girls in power suits to be performing behind the counter. Such sterotypes are quickly forgotten when L'Atelier's French manager gently and warmly welcomes you, showing you to your seat at the long bar where, along with the other couples dining tonight, you will eat your meal side by side instead of face to face. Sitting down to peruse the space you might note whimsical decor touches, a fish bowl full of eggs, vegetables beautifully sorted by colour, red Staub cookware. Against the black backdrop, all of these things shine. The menu sings to me. It is packed full of things I want to eat, tastes I can't wait to try, combinations about which I wonder. It is one of those menus where I just can't decide what to have. I greedily request four different things from the menu of small tasting portions. It turns out that the food is decent enough but it doesn't blow me away as I expect and hope it will. At every course, at once I wish I'd ordered the other thing that had caught my eye. 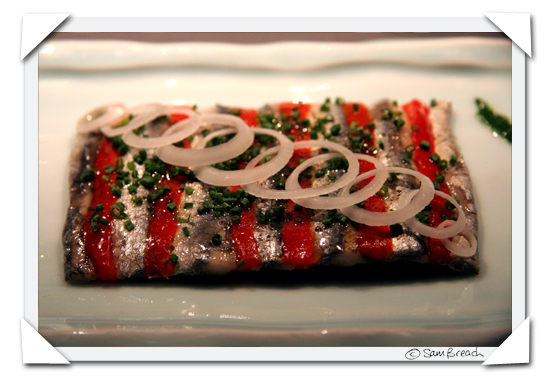 Glistening silver anchovies alternate with strips of red pepper to mimic an exquisitely wrapped gift. But the crimson capsicum overpower the poor aubergine who I expect to be the leading vegetable in this presentation. 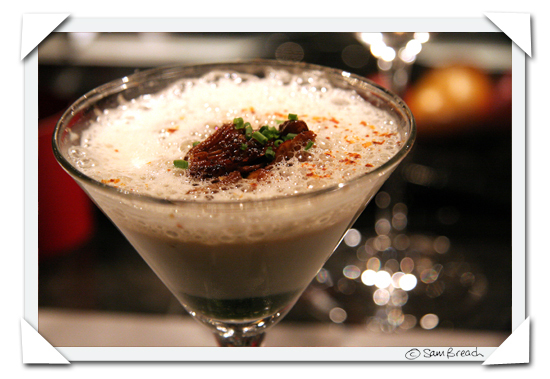 A barely-cooked egg, is engulfed by a thin but flavourful mushroom cream and then served in a martini glass. Having tried Manresa's ode to the Aperge egg just a few days before my dinner at L'Atelier, Robuchon's preparation, although adequate, just can't live up to my new epitome of egg. I am certainly not averse to runny egg, but since even the white was not opaque all the way through, I would have preferred it just a little more cooked. A chestnut veloute with caramelized foie gras and crispy bacon is a modest precursor to my final savoury course, seared tuna belly. No diner should expect the lightness and freshness more often afforded by tuna on restaurant menus after reading the words 'onion rings' and 'belly' in the description of a dish. Indeed, it was rich, oily and much larger than I expected for a small plate. Together with the famous Robuchon potato puree I was kindly treated to after I'd made a request to try it, I was almost beaten by this course. However, once I tried the incredibly smooth potatoes, whipped together with what must surely be considered more than a fair share of butter, I couldn't stop myself from returning to it for spoonful after spoonful. Fred made much more simple choices than I did. Robuchon's French-style hangar steak with fried shallots is something he still excitedly talks about today, two months after the meal. In fact he can't wait to return to L'Atelier. And even though the food didn't thrill me, the overall experience of our meal did, and I wouldn't hesitate in joining him to give it a second try. The service was genuine and warm. I loved the interaction with other the guests sitting to each side and between customers and the kitchen, the chance to watch the line cooks at work, the fact the Chef comes to personally greet every one of his guests. Our server was engaging, genuine and astute to our questioning. He helped us with wine pairings, advised us on portion sizes and seemed to know the menu like the back of his hand. He made us feel comfortable and at home. 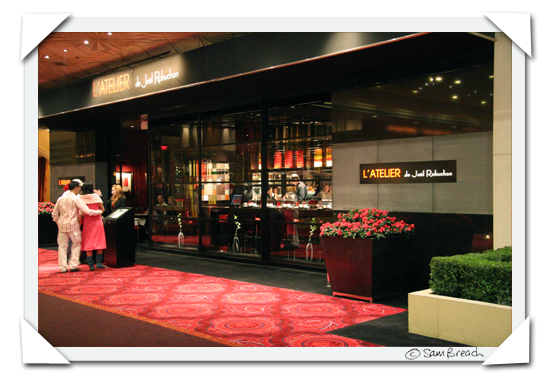 L'Atelier de Joel Robuchon reminds me that an enjoyable dinner is not only about the what's on the plate, and when an establishment hits the service element right on the spot, then the memory of the meal will usally be a far more fond one than food could ever elicit by itself. And a well-earnt Michelin star for him over here! You are intriguing me now with this place. I would love to give it a go, if only it were closer! Love the pic with the anchovies btw! Shining! The food photos look impressive but I might have gone with Fred on menu choice. We have been to his place in Paris which looks almost exactly the same and from the food descriptions is also consistent. We loved it. It showed true creativity in food. Robert Palmer: RIP. Handsome man. I always feel sad, because I had such a lovely lunch at Seize Au Seize, with my son in Paris (2004) and it switched soon after to Joel's Atelier. That said, the coquette looked very nice. I'll second Trig - a well-deserved star for JR here at the London L'Atelier. I just had an apege egg at manresa this past saturday.. I was left wondering if I had missed something. It just didn't thrill me. the texture was lovley and whipped, but the maple syrup in it was just odd... Excellent Blog! Looks like an excellent atmosphere. I will just admire it all the way from Australia. The MGM grand just facinates me. Especially after watching the Top Chef series. Great Blog. Keep up the great work. As soon as I saw the words tuna belly, I knew it would be a big and heavy flavor. Jeffrey Steingarten, in his wonderful book It Must Have Been Something I Ate, sings tuna belly's praises even as he tells funny stories of its non-acceptance in some circles. When he fished for tuna somewhere on the eastern seaboard [maybe in the Carolinas? ], his fellow fishermen were ready to throw it to the dogs hanging around the docks. Instead, he claimed it all. 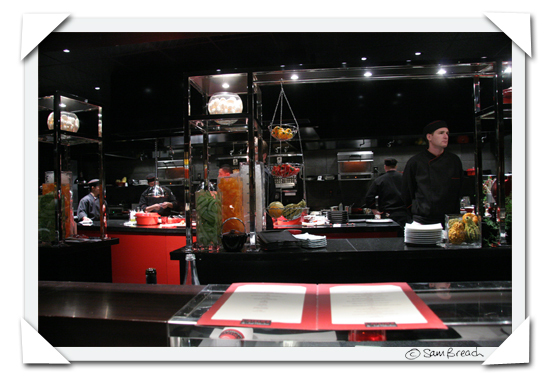 Did you know that MARCEL from Top Chef works at Robuchon in LV? 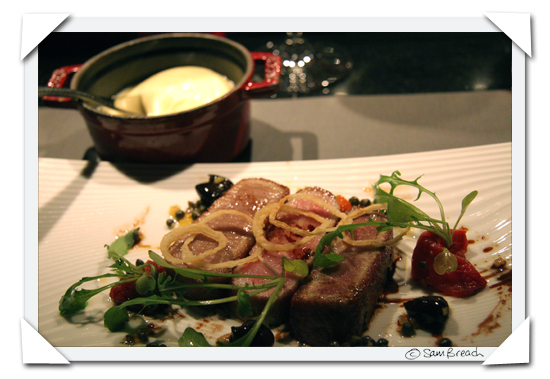 trig - i think some one should visit every Joel Robuchon in the world and compare and contrast them! Bea - there is one in NYC if you want somewhere closer to you. But anytime you want to party in Vegas - we'll meet you there. foodie froggie - well it ain't cheap, so you better check there aren't places you'd rather visit first - Paris is full of good food isnt it? chrisb - mum - well maybe next time you are here you will have to go there with fred? wmm - is that as much as you are going to admit to? I saw Tom Jones play there once. And the sell good shirts. Fred has about a dozen from one MGM store. It's our secret shopping emporium. cookiecrumb - i fail to believe he is dead, it just doesn't seem possible, does it? palette - well at least you have a memory that can never be bettered or spoilt. You have the special feeling of a wonderful meal that no one else can ever experience. harro - now tat's greedy ;) Don't you have enough wonderful restaurants in Singapore? jeanne - and pray tell - how does your house decor look today??? I don't mind underdone egg, but this one was almost raw in places which i thought was underdone a little too far, but i could still cope with it anyway. sara - i am sorry you didn't like it because it blew me away. I am going to the Passard dinner at manresa in March so I am wondering if we will get the original or not? Squishy - you know what you have to do - you have to make plans to visit the US! terryb - i guess i was thinking of pork belly when i ordered it - another rich dish -- but the advantage the pork has is the crispy fat around the edge which I am not sure you can get with tuna. 5%c ashamed to say I did not. I never watch tv or top chef. If I watched tv I wouldnt have time to write this blog - would I now, donja know? Wow talk about gorgeous presentation with food. Food really does have to taste fantastic but presenation is just as important sometimes,especially if you are serving at a fancy restaurant as you mentioned.